The Holy Great Martyr Artemius was a prominent military leader during the reign of the Equal-to-the-Apostles emperor Constantine the Great, and later also of his son and successor Constantius. Artemius held many awards for distinguished service and courage, and he was appointed viceroy of Egypt. In this official position he did much for spreading and strengthening Christianity in Egypt. The emperor Constantius was succeeded on the throne by Julian the Apostate (361-363). Julian in his desire to restore paganism carried on an implacable struggle with Christianity, sending hundreds to their death.At Antioch he ordered the torture of two bishops unwilling to forsake the Christian faith. During this time Saint Artemius arrived in the city and publicly denounced Julian for his impiety. The enraged Julian subjected the saint to terrible tortures, after which they threw the great martyr Artemius into prison. During the time of prayer which the saint offered to the Lord, Christ Himself appeared to him surrounded by angels and said, “Take courage, Artemius! I am with thee and wilt preserve thee from every hurt which the tormentors may inflict upon thee, and already have I prepared thy crown of glory. Wherefore as thou hast confessed Me before the people on earth, so also shalt I confess thee before Mine Heavenly Father. Therefore, take courage and rejoice, thou shalt be with Me in My Kingdom.” Hearing this of the Lord Himself, Artemius rejoiced and began fervently to offer up glory and thanksgiving to Him. On the following day, Julian demanded that the great martyr Artemius honour the pagan gods. Meeting with steadfast refusal, the emperor resorted to torture. The saint endured all without a single moan. The saint then predicted to Julian that he would soon receive just recompense for the evil done by him to Christians. Julian became furious and resorted to even more fiercesome tortures, but they did not break the will of the saint, and finally the great martyr Artemius was beheaded (+ 362). His remains were buried by Christians. And after the death of the holy great martyr Artemius, his prophecy about the impending perishing of Julian the Apostate came true. Julian left Antioch for a war with the Persians. Near the Persian city of Ctesiphon he came upon an elderly Persian, who agreed to betray his countrymen and guide Julian’s army. But the old man deceived Julian and led his army into an impassable place in the Karmanite wilderness, where there was neither food nor water. Worn down by hunger and thirst, the Greco-Roman army of Julian had to do battle against fresh Persian forces. Divine retribution caught up here with Julian the Apostate. At the time of battle he was mortally wounded by an unseen hand and an unseen weapon. 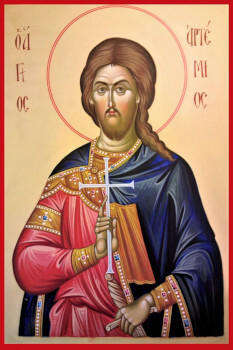 Julian groaned deeply, and dying, he said: “Thou hast conquered, Gallileian!” After the perishing of the apostate-emperor, the relics of the great martyr Artemius were transferred with honour from Antioch to Constantinople.